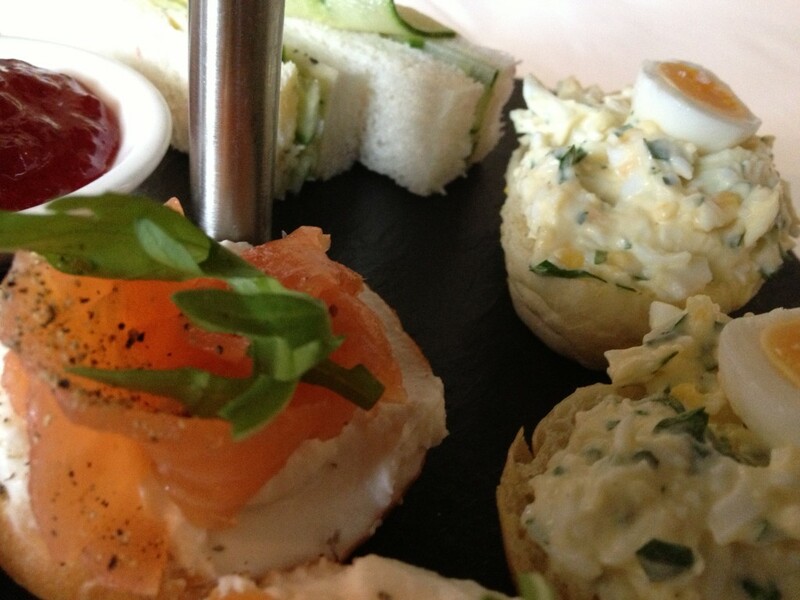 The Afternoon Tea offer at Gallery Mess is at three levels according to how greedy you are feeling. 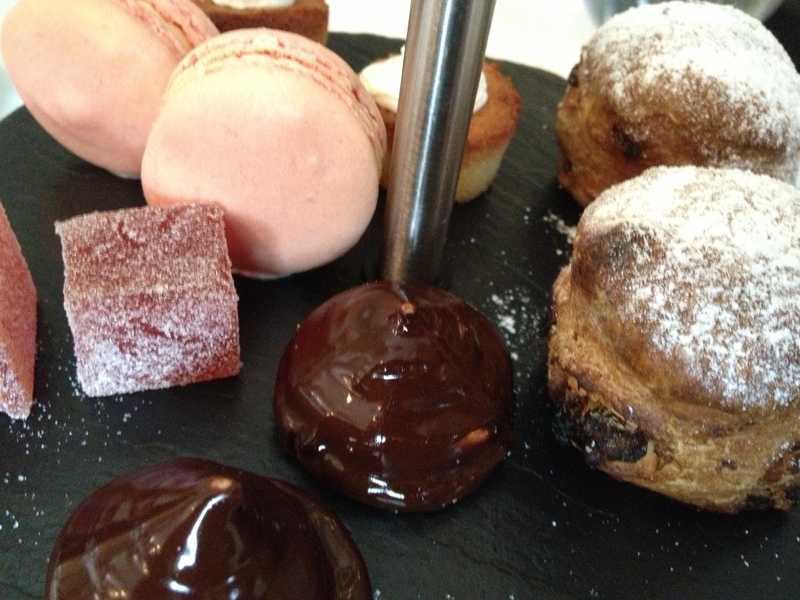 Tea and scones (£9.50) comes with clotted cream and strawberry jam; the Afternoon Tea (£11.50) adds in some mini sandwiches and the piece de resistance, The Pommery Champagne Afternoon Tea (£22.50) adds a glass of Pommery Brut Royal NV and some mini cakes. To honour the punkettes we went for the champagne option. 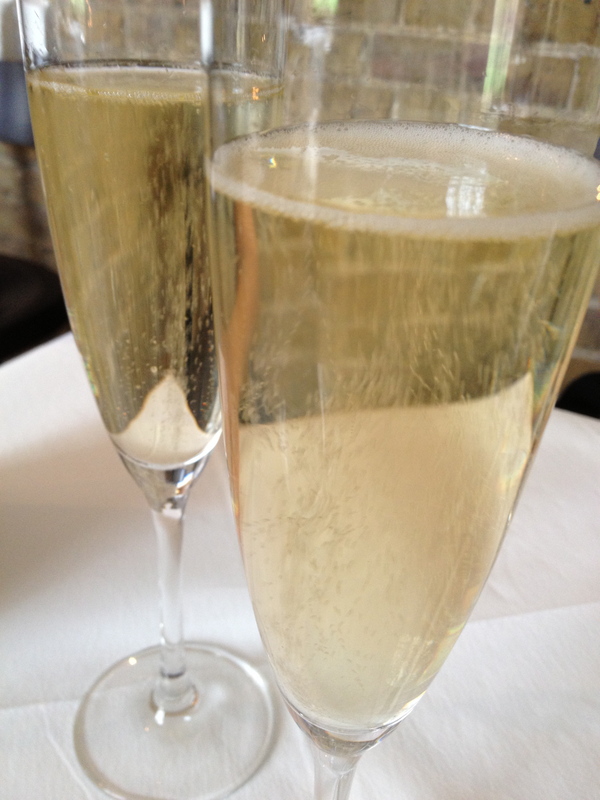 The Pommery is a lively number and has notes of toasted brioche and apple, setting us up for the sandwich selection. There were mini bagels and lox, egg mayo on little finger rolls with half a boiled quail’s egg on top and then ‘proper’ cucumber sandwiches. 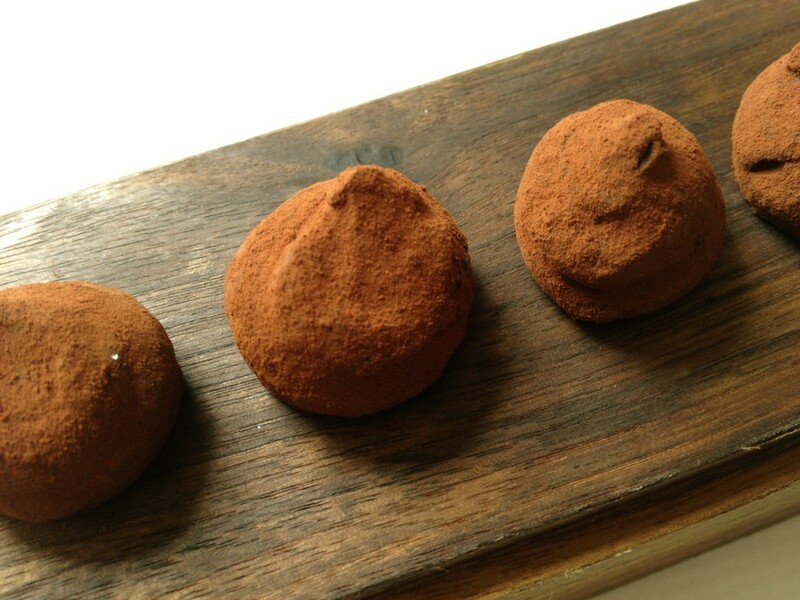 The savouries were all well executed with little twists in presentation or taste that added value. 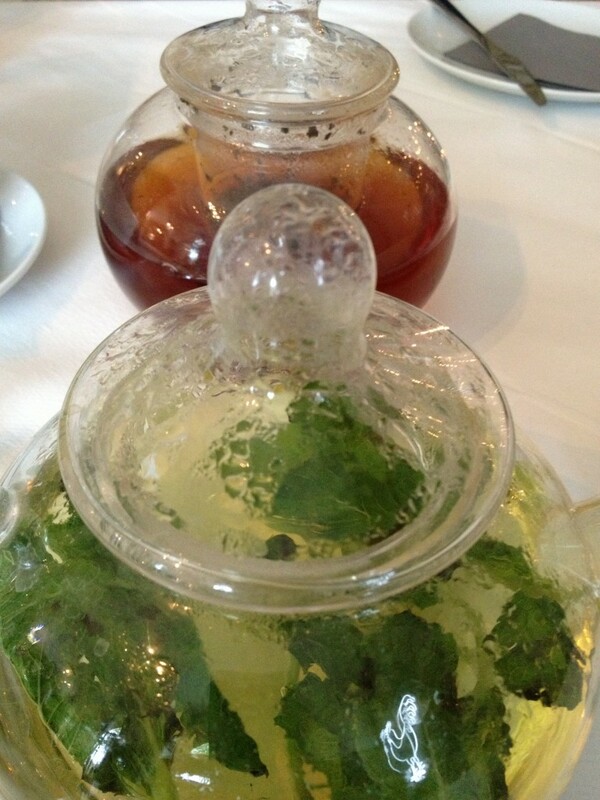 Freshly brewed Fresh mint and Earl Grey teas turned up at this point which was a good thing as we were out of fizz! 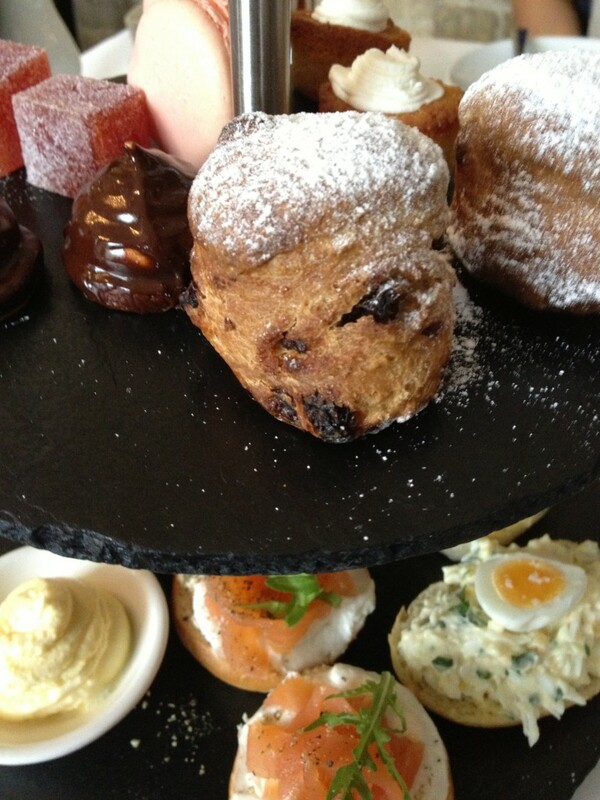 The next element in our tea-time odyssey were home made Raisin scones served warm with clotted cream and strawberry jam. To finish off we wolfed down the mini cakes. The Frangipani cake was deliciously dense, almondy and eggy. Rose macarons were gooey and just faintly perfumed. La Hedonista thought that the Chocolate cream and marshmallow Tea cakes were like Wagon Wheels but I couldn’t possibly comment. Finally some Turkish Delight. I’m not really a fan of Turkish Delight but this was mildly flavoured and pretty good. 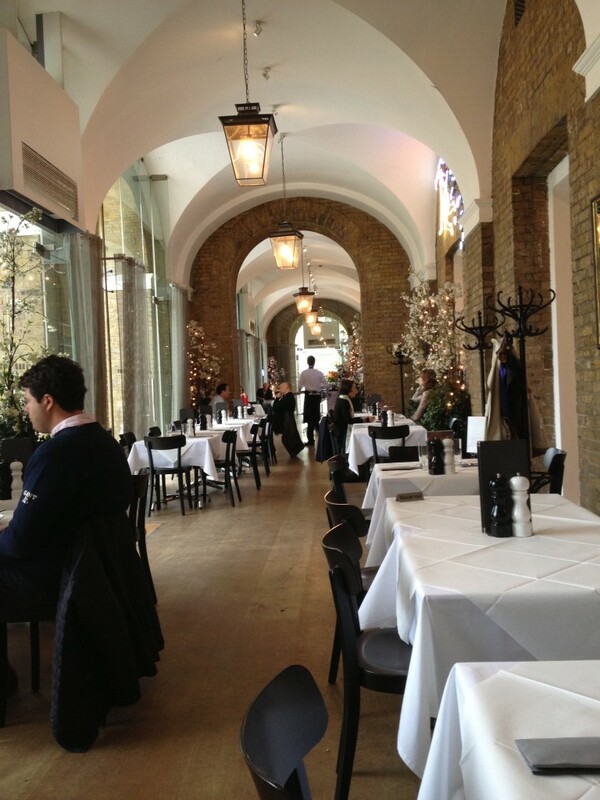 If you are shopping in Sloane St or the the King’s Rd, are a refugee from the Chelsea Flower Show or hitting the art at the Saatchi then Gallery Mess is a really good tea option, it also has a strong cocktail list or if you want something more substantial a full restaurant menu. It’s a cool space, the service is efficient and friendly and you’ll even get a chance to revisit your inner punk! I love The Saatchi Gallery. It’s a great space for showing contemporary art and the Duke of York’s HQ retail area surrounding it has been tastefully developed creating its own little ‘Sloane quartier.’ But where to eat after a hard day at the coal face of cutting edge visual culture or … shopping? 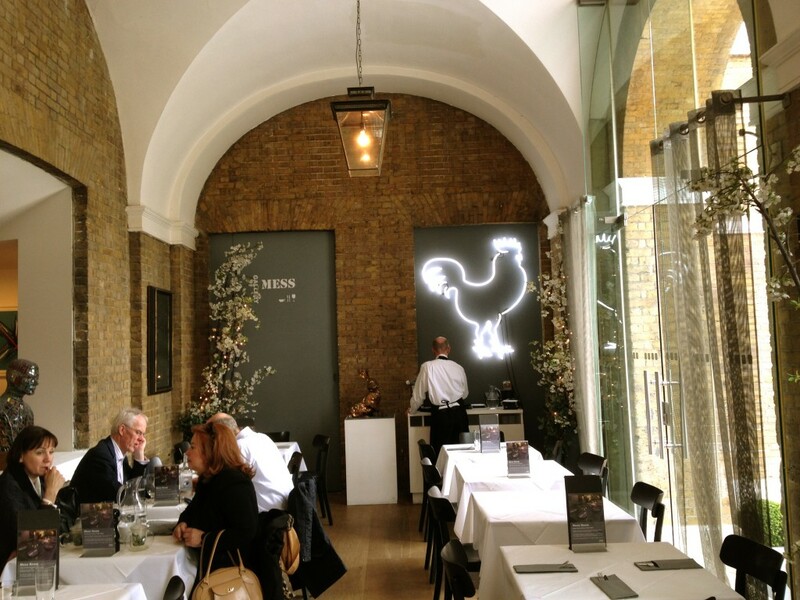 Sloane Square is renowned for places not to eat and Colbert is always busy so what about Gallery Mess Café/Bar which is the Saatchi’s in-house pit-stop? 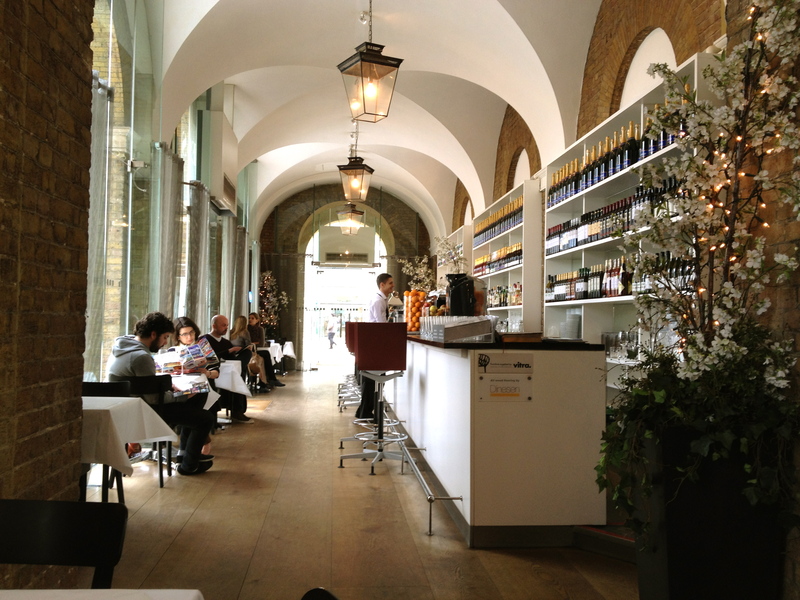 Run by the “rhubarb’ food consultancy and situated in an attractively bright and airy space dotted with artworks, Gallery Mess offers more than the cafe/bar tag suggests with a full Modern European menu on offer along with the cocktails and cakes. 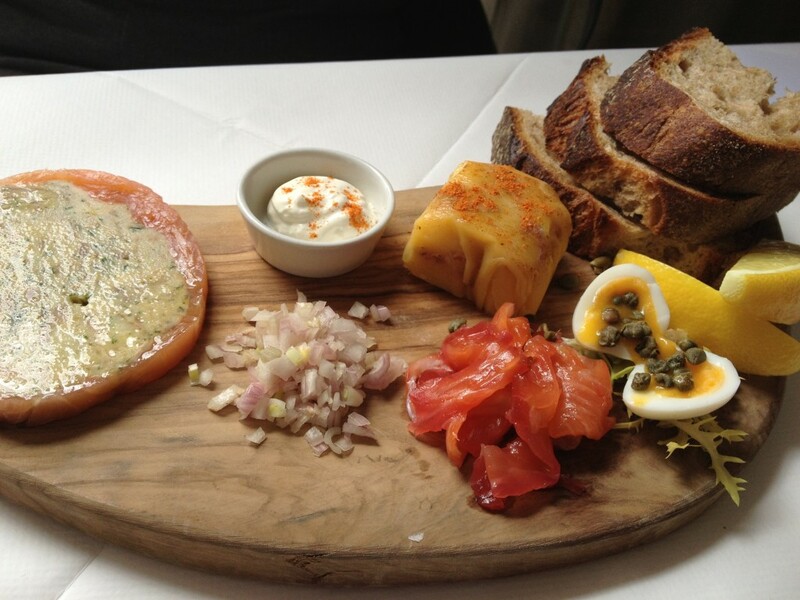 We started with a Platter of British Smoked Fish (£14) made up of Smoked mackerel rillette, potted shrimps, smoked salmon, creme fraiche and quails eggs accompanied by decent sourdough bread. This was pretty good with the potted shrimps and mackerel having good flavour and some of the salmon being of the very trendy beetroot cured variety. My only caveat would be size of the portion which wasn’t quite enough as a starter for two greedy people but would be fine for a light snack for one. 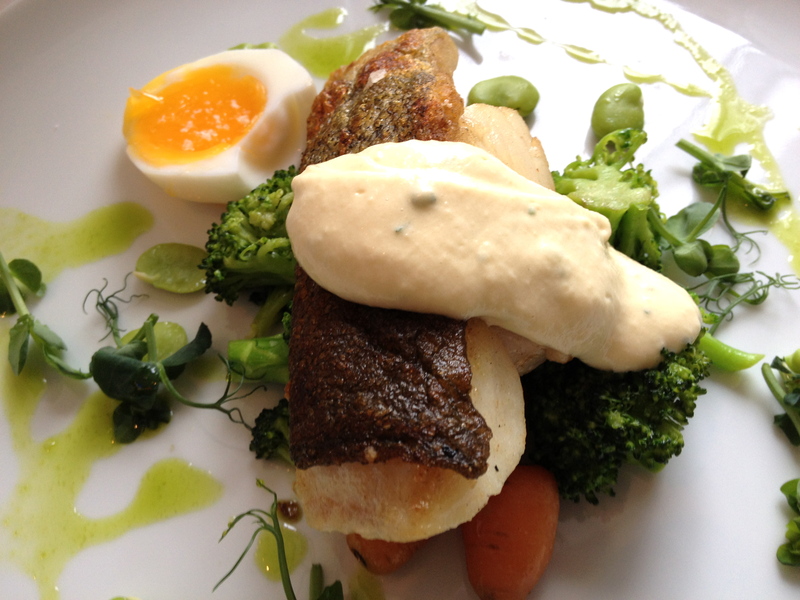 My luncheon companion, the fragrant Fiona from London Unattached, chose for her main course what she described as a ‘beautifully composed’ special of cod, broad beans, soft boiled egg and aioli. 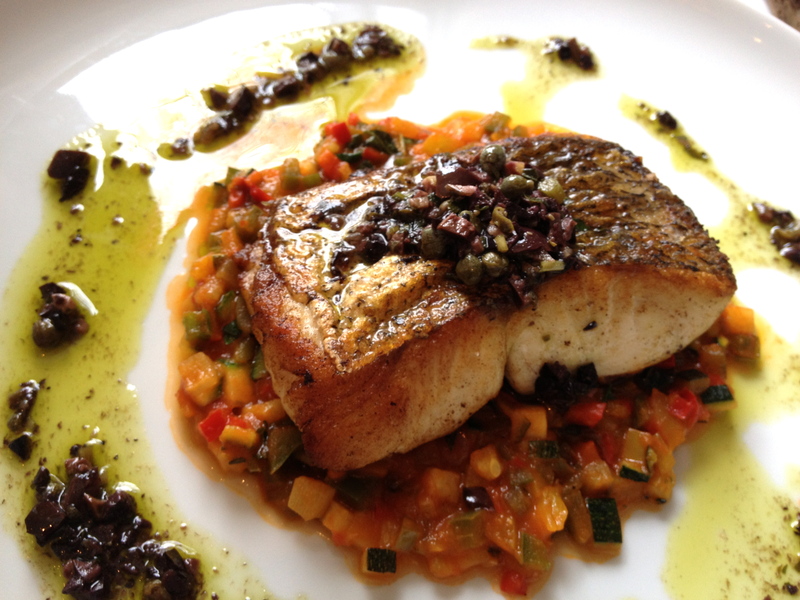 It was a gentle combination given a bit of bite with the aioli, but the fish was overdone, as it was in my choice of Pan Fried Hake, peperonata, black olive and confit shallot dressing (£18.75) which was potentially delicious. Both dishes looked as if they had been sitting on the pass too long which was a shame as their is clearly some in the kitchen who can cook. Sides of chips and spinach (£3.50 each) were perfect. We were drinking a bottle of 2011 Dopff au Moulin Pinot Blanc which had an apple blossom nose and notes of ripe pears and almonds. I’m a fan of Alsatian Pinot Blanc and this was light but with enough minerality to stand up to the aioli and peperonata. 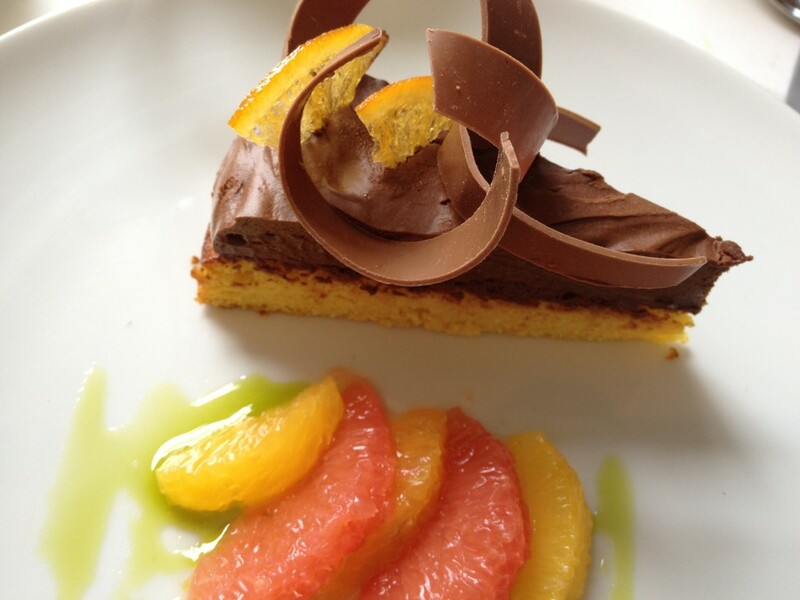 Chocolate and Orange pudding (£6.50) which was the standout dish of the meal. Normally I prefer my chocolate to be bitter but with a light orange sponge this lighter ganache was lovely. 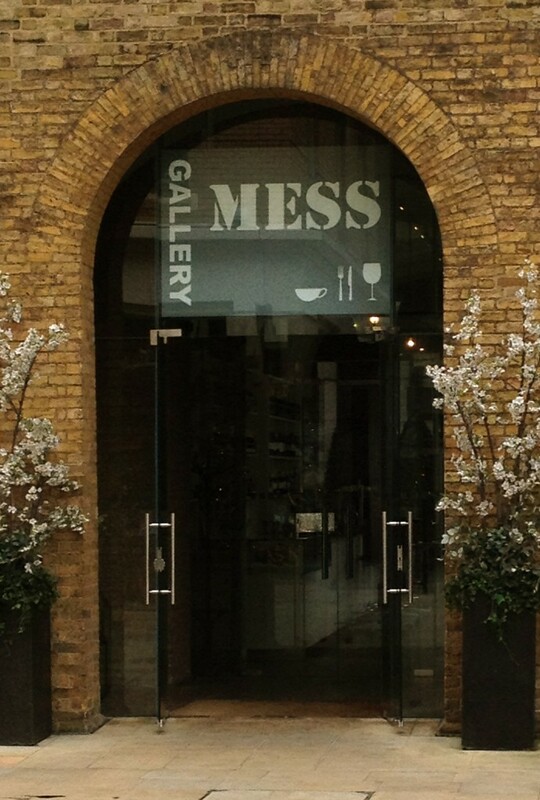 Gallery Mess is a lovely space for shoppers, art hounds, lunching ladies and the local yummy mummies. The menu is flexible enough to make it an all day option and with a little more care with the service it could become a local destination.